Lots of shots of episodes to come to make our mouth water. Looks like there will be loads of drama and emotions in this series. Remember, Marcus Lemonis is going to invest HIS OWN MONEY to try to turn the business around. He is therefore personally invested and interested in seeing the business succeed. The company Marcus visits in this episode is called Car Cash. Car Cash buys your used car paying you in cash. Founded in 1977 by late Bruce Baron, it is based in New York City and is run by 2 sons, Jonathan and Andrew Baron. It is on the brink of failure. Very early in the episode, we find out that the relationship between the brothers is very strained. The recession and the fact that business is not going well is not helping matters. The business is $200,000+ in debt and hasn’t made a profit in a while with both brothers not haven taken a salary in months. Marcus quickly finds out that the overhead of the business is a $100k, with profits ranging from $50,000 to $100,000 per month, the company is losing money every month on average. He also sees that the workplace looks tired and worn down. Andrew, being a stylish guy agrees with Marcus about sprucing up the place a bit. Johnathan doesn’t think that is needed. Looks like Johnathan won’t let his brother make decisions for the business as he doesn’t see him responsible enough. From here on, Marcus becomes a kind of business mentor/psychologist to help the business as well as mend the relationship between the brothers. 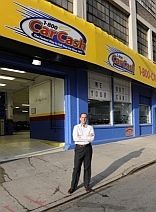 Marcus finds out that various whole sellers visit regularly to buy cars in bulk from Car Cash. He sees this as the biggest leakage of money from the business. Car Cash is basically selling cars in bulk to these middlemen hereby making very very slim margins on the cars. Marcus confronts Johnathan about these middlemen and finds out that due to trust, friendship and the steady stream of business they generate, Johnathan seems to be locked into selling his cars to middlemen. Explaining to Johnathan that $1000+ could be made per car if Car Cash can skip the middlemen and sell directly to dealers, the company could generate an extra $80,000 per month based on their monthly sales of roughly 80 cars. All this without having to change anything else at all. Here are the basic issues Marcus found in Car Cash. Very little client traffic compared to their huge advertising spend. Not correctly appraising the cars they buy from clients. Middle men eating into the profits. Unstable relationship and mistrust between the brothers. Marcus takes full control of the business during the fix up process. Complete over-haul of the building and image of the business. Sprucing up the premises to create an ideal business location other licensees would aspire to. 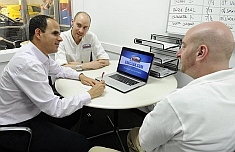 The customer needs to be present during the appraisal so they understand the true value of their car. Selling cars directly to dealers getting rid of the wholesalers. Create a franchise system in order to expand their business and opening more locations across the country. Fixing the relationship between the brothers so that they can both trust each other to run the business correctly. Marcus is offering the Baron brothers $200,000 which will solve the debt currently owned by the business and a franchise system. Johnathan counters by asking for a $300,000 line of credit for car purchases. Marcus responds with an interest rate of 10% and they finally settle for 7.5% and the process of turning the business around begins. After all the changes were made, Car Cash is now flourishing. With the new marketing plan and the media adverts created by Andrew, transactions are now 30% up. By implementing the new appraisal procedure suggested by Marcus, Car Cash now makes on average $2000 per car. A call center has been added to the business, Mobile advert vehicles are now on the road and licensees are opening up across the country. Most importantly, the relationship between the brothers is now mended. Car cash is now profitable and it looks like Marcus may have hit the jackpot on this deal. So what is your take on the episode and Car Cash? Join the discussion and let us know what you think. Hope you enjoyed our summary of Car Cash and this first episode of The Profit CNBC. anyone know where I can watch season 1? I just finished season 2 and loved it. But I cant find/buy season 1 anywhere. Thoughts? I don’t know why but CNBC is not releasing Season1 anywhere. I’d buy the DVD but they don’t offer it. Not even Hulu Plus has them.